Practicality and beauty aren't often found in the same package, which makes the Gozzard 36 a standout. Beamy and solidly constructed, this traditional-style cutter with a clipper bow is hard to ignore at the dock and or under sail. After all, it's a 36-foot yacht that extends beyond 42 feet when the sprit and aft dinghy davits are included in the measurement. And it can carry 1,000 square feet of sail. It was designed by H. Ted Gozzard, and 84 hulls were built by the family's North Castle Marine boatworks in Goderich, Ontario, Canada, between 1984 and 1998. The richly appointed interior layouts, as well as the engine location and relative horsepower evolved as production continued, but build quality never veered from excellent. Gozzard got his start in the early 1960s as a carpenter's apprentice in his native England. According to Mike Gozzard, who runs the business today, his father became intrigued by the Thunderbird class sailboats before moving with his wife and two children to the Caribbean. "He was a beach bum in the Bahamas," Gozzard said. "When he came back he built a trimaran." In 1970, brothers Ted and Haydn Gozzard founded the Bayfield Boat Yard in Ontario, Canada, and by 1981 discord was brewing and Ted sold his share of Bayfield in order to form his own company, North Castle Marine Ltd. and Gozzard Yachts. "My dad's best work, well, some of it is off the top," said Mike Gozzard, citing his father's concepts for a hard windshield, a pod island in the cockpit, open transoms and an interior that could be customized on a whim. "The cockpits were so wide there was nothing to put your feet up against, so he created the pod," he said. "The hard windshield was designed in 1985 to allow seeing straight over the top." Gozzard designed his last standard V-berth in 1973, opting instead for flexible spaces that could serve as both sitting areas and sleeping quarters. Three years ago, Gozzard suffered a stroke. "He's 78 but he still comes into the office three days a week," Mike Gozzard said. "He's a brilliant man. Always has been." You won't find any smoke-tinted Lexan hatches or racy toerails on the Gozzard 36. It has more the look of a traditional yacht encouraged by the pronounced clipper bow, sculpted wood trim, heavy-duty portals and, of course, the wooden butterfly hatches with leaded glass that grace the deck. The cutter rig suggests this is a yacht that can handle loads of canvas and still make way in most any sea. Belowdecks, it's impossible not to appreciate the craftsmanship that went into the cabinetry and overall joinerwork. By all accounts, the Gozzard 36 is a limited production boat built to withstand punishing seas while keeping its crew safe and comfortable. "In my opinion, the strongest element of this boat is how it's built. You have high-quality construction and it's also beautiful, with the long bowsprit, butterfly hatches and rich woods," said Florida yacht broker Jim Guernsey. "If you talk to the owners, you'll find there is a lot of confidence in the boat's ability to handle most any sea." The boat has what Gozzard called a modified 4-foot keel, which is paired with skeg-hung rudder. Prior to 1980, all of the Gozzard designs had traditional full keels. By the mid-1980s those keels evolved into the modified version by employing the Brewer Bit, first designed by Ted Brewer. A large section of the full keel design was cut away in front of the rudder and the forefoot was trimmed. The Gozzard 36 has an unusual interior that includes a scheme of movable bulkheads and gear that can be multi-purposed. Inspect the operation of the sliding bulkheads and the forward settees, which transform into a double berth. Although Gozzard yachts are known for quality workmanship, inspect the deck and cabin sole for delamination, as you would with any boat. The engine can be accessed through compartment hatches. Inspect for wear on belts and hoses. Fluids should not be black, which would indicate a lack of maintenance. All standing rigging should be examined since some Gozzard 36s are nearing 30 years old. Electronics for navigational purposes are likely outdated. 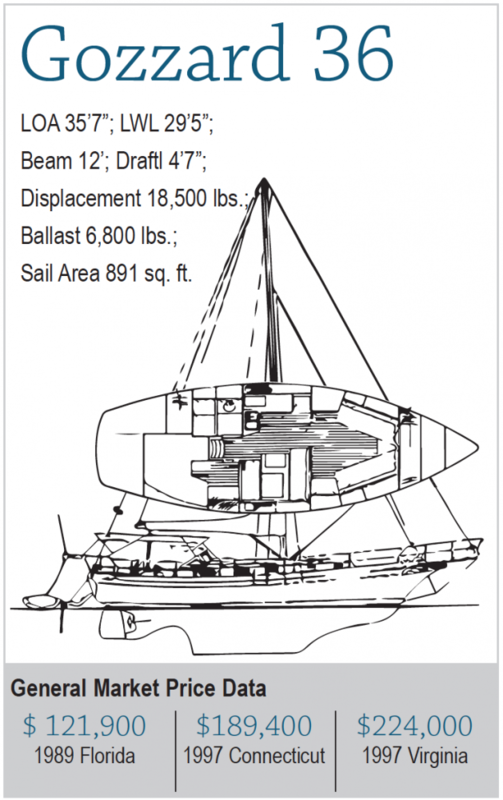 A 12-foot beam and wide side decks make sail handling safer, although twin furlers do most of the headsail work. The cockpit is so wide Gozzard installed a box-like "island pod" just forward of the steering pedestal that acts as a table, foot rest and platform on which to mount winches and the mainsheet. A wide bow pulpit accommodates heavy anchors, and a fold-down stern gate doubles as a swim platform with ladder. Two butterfly hatches with varnished wood panels add a touch of elegance. "Most people raise an eyebrow when they first see the interior," said Guernsey, who refers to this section of the boat as the Transformer interior, a reference to the children's toys capable of changing shape by adjusting their parts. "It's very unusual because the bulkheads are designed to be moved. You can have an interior with three cabins or one big open space." "My wife likes the openness of it," said Gozzard 36 owner Tom Freeland. "With a single large cabin, there's only one modest disadvantage in that you need to make the bed every day." Gozzard built two settees benches into the forepeak that slide together to form a centerline double berth. "Setting up the double berth takes less than two minutes and you don't need a toolbox," Freeland said. The galley is equipped with a two-burner stove with oven, deep stainless sink, large counter and overhead storage cabinets. There's also a nav station, large quarterberth and a head with separate shower stall, the latter not often found on 36-footers. Throughout the production run engine size increased. Hulls No. 1 and 3 were fitted with 33-horsepower Westerbeke diesels. The next four dozen yachts had the standard 46-horsepower or optional 52-horsepower and after hull No. 52, the 63-horsepower became the standard. The Westerbeke 46 makes 7 knots very comfortably. With a Kiwi prop it moves along at 7 knots at 1,500 rpm. Owners report the 52-horsepower engine allows economical cruising at 6 to 7 knots with sufficient power to bash through a chop. Gozzard 36 owner Wade Ogden frequently singlehands, which he claims isn't a challenge since he brought all lines back to the cockpit. "It's the perfect boat for a couple to go up and down the coasts in style," he said. "It's easy to sail and can turn within two boat lengths." Freeland says his Gozzard 36 doesn't point as high as some boats, but has no problem keeping pace with Cabo Ricos and Island Packets. Yet another owner recalled running downwind in 35-knot winds and 20-foot seas off the Oregon coast and witnessing the boat track with little discomfort. In Mexico, while motoring at night, the shallow-draft Gozzard 36 skimmed over fishing nets while other boats snagged their fin keels and unprotected propellers, he said. The Gozzard 36 is an exceptional cruising yacht, safe and comfortable, high in build quality, capable of bluewater passagemaking, and ideally suited for a couple, although its multi-function interior can create additional cabins for privacy. PRICE: A used Gozzard 36 can be had for between $89,000 and $224,000 but price mostly depends on age and overall condition. Most semi-custom Gozzard yachts tend to be more expensive than strictly production vessels of the same length and vintage. DESIGN QUALITY: Designed by H. Ted Gozzard, the boat was a traditional-style cutter with a clipper bow. The Gozzard 36 has some unconventional features, such as an interior with sliding bulkheads to rearrange the cabin configuration and settees that are easily converted into a centerline doubleberth. CONSTRUCTION QUALITY: The hull is balsa cored except in areas around through-hull fittings. Master craftsmanship is found throughout the vessel as evidenced by the plentiful woodwork and joinery. USER-FRIENDLINESS: It was designed with low freeboard, making it easy to board from a dock or dinghy. The keel has a draft of less than 5 feet and the mast is less than 50 feet, giving the boat the ability to sail shallow waters and the ICW. SAFETY: It is unquestionably a bluewater boat, although some owners complain the cockpit may be too spacious and slow to drain if swamped. The external lead keel provides plenty of ballast to maintain stability. TYPICAL CONDITION: Most Gozzard yachts have been lovingly maintained by their owners and occasionally returned to the company for upgrades. Owners mention the difficultly of keeping up with varnishing the abundant teak. No major problems have been reported regarding the Gozzard 36's rugged construction. REFITTING: Modifications were made to the design throughout the 15 years. The 46-horsepower Westebeke diesel was standard, although a 52-horsepower model was optional. The later models were fitted with 63-horsepower diesels. Some owners have installed travelers. SUPPORT: Gozzard Yachts is still in business, headquartered in Goderich, Ontario, Canada, and Mike Gozzard and others at the company are knowledgeable and helpful, with information available at www.gozzard.com. AVAILABILITY: There are always Gozzard 36s on the market, and according to the company, the boats often become available through estate sales because they remain under family ownership for many years. Eighty-four were built. INVESTMENT AND RESALE: Gozzards yachts tend to hold their value and the Gozzard 36 is no exception.